EU chief Brexit negotiator Michel Barnier, second left, talks to other European Commissioners before a weekly meeting at the European Commission headquarters in Brussels, Wednesday, Oct. 10, 2018. 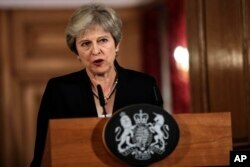 British Prime Minister Theresa May goes before European Union leaders Wednesday as the two sides faced stalled talks in the negotiations over Britain's exit from the bloc. Months of talks have produced agreements on many parts of how to unravel the relationship, but some key hurdles remain, including how to handle the border between Northern Ireland and EU member Ireland. After May addresses the group, the other 27 leaders will have dinner on their own to discuss the Brexit negotiations. EU Council President Donald Tusk said ahead of Wednesday's meetings he planned to ask May "whether she has concrete proposals on how to break the impasse." Tusk said that will determine if it is possible to resolve the differences and proceed toward the orderly breakup planned for March of next year. He also warned that EU leaders need to discuss how to prepare for a so-called "no-deal Brexit," under which Britain would exit the EU without any formal measures in place resolving issues such as trade and freedom of movement. ​EU leaders will decide whether to hold a special summit in November, but Tusk said there needs to be reason to believe the two sides are close to a breakthrough. The European Union wants Northern Ireland, regardless of whether there’s a subsequent trade deal with Britain, to remain inside the bloc’s customs union so as to avoid the necessity of border controls between the British province and the Irish Republic. Brussels is backed in this demand by the Irish government, which wants Northern Ireland to remain closely tied to European regulations on goods and services, including customs arrangements, after Britain leaves the bloc. May says treating Northern Ireland differently from the rest of Britain would mean, in effect, that there would have to be "a border in the Irish Sea," separating two parts of Britain. The EU proposal on how to handle the Northern Ireland border "threatens the integrity of our United Kingdom," she told British lawmakers Monday in bruising exchanges in the House of Commons. But Ireland’s foreign minister, Simon Coveney, says a backstop is essential.